Compare the left panel to the right panel to really see the difference before and after! 4U2CLEAN™ was sprayed on the right panel; then wiped off with a soft clean cloth; then followed by an application of 4U2POLISH™. The polish was applied with a soft cloth and removed by hand with another clean soft cloth. You can really see the difference! 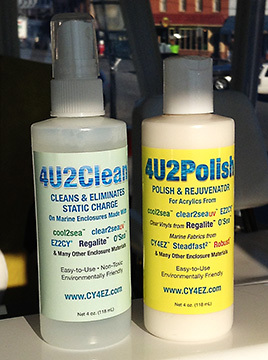 4U2CLEAN™ and 4U2POLISH™ have been tested and approved for the transparent acrylics, O’Sea™ scratch resistant vinyl, regalite® vinyl as well as marine cover fabrics that border these enclosure materials such as Steadfast2 and all CY4EZ fabrics. Take it from a boater, these products are easy to use and they work in real world conditions. A 4 oz. bottle of the cleaner/polisher covers approximately 220 Sq.Ft. enclosure inside and out (e.g., the enclosure on EZ2CY Aqua Epicurean). Also available at participating marine supply stores! Dirty Enclsoure Windows? No Problem! Below: Jeff demonstrates the solution to dirty enclosure windows! Below: Water beads up during rain.